I think one of the factors which has really prevented us taking full advantage of our blog for communicating with the-world-at-large (other than my particular reluctance for being outgoing) is that the web based blogging tools we use - in our case Movable Type - seem to be quite unwieldy. Contribute is an increasingly pricey bit of software (currently £140 ish direct from Adobe, per copy). That said it's a great tool and gives non-technical users the ability to update most of the content on a website with a user interface of Internet Explorer glued to Microsoft Word. So the hard choice is whether to use a free/cheap web-based tool, with all the browser foibles, overly complex (and often non-WYSIWYG) interface or to cough up a chunk of cash for the Contribute solution. Perhaps that choice has just become a bit easier to make... 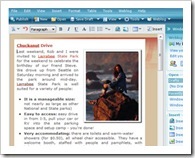 I've just published this entry using the freebie Windows Live Writer. It seems to do the job that Contribute does with blogs: nice intuitive interface, WYSIWYG editing layout, good support for adding and resizing images but unlike Contribute it's all provided free of charge! Time will tell whether we direct clients down this route for website editing (and of course we'll have to find a way around the fact that Live Writer doesn't let you edit general website content) but it seems like a good start. Good enough to get me to write a sizable blog post for the first time!